I don’t think many Christians ever ask themselves if their pastor is part of the growing apostate church. I also don’t think most Christians ever ask themselves if their pastor would protect the congregation from wolves in sheep’s clothing or if is it possible that the pastor may be a wolf himself. I believe we are taking way too much for granted these days. My goal is to help bring light to these questions and more. 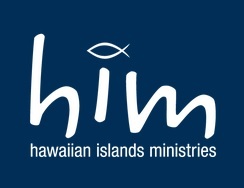 On March 16,17,18 2017, the HIM 2017 conference is coming to the Hawaii Convention Center. Many well known pastors from Hawaii are attending. This article will take a brief look at who are they sharing the stage with and what their purpose is. Are they declaring the truth of the Word of God or is something else happening here? The lineup for the Hawaiian Islands Ministries 2017 conference has been announced and published online. Many familiar faces from around Hawaii are on the lineup and it almost puts me off guard to look any further for anything problematic. Certainly if Ralph Moore and Elwin Ahu are going, it’s got to be a solid conference, right? Many of these so called Christian conferences across the USA have stopped listing names of their speakers because many of them are into emergent, ecumenical doctrines, contemplative prayer, dominionism and mystical heresies and people like myself have been (to their annoyance) pointing them out. The hosts of HIM 2017 apparently have not gotten the memo because they list several speakers that have no business at a protestant, charismatic, evangelical conference. Before I start calling people out. A little foundation on where a bible believer should stand. I am putting up a few of the obvious ones today but plan on expanding this warning as the conference nears, so more Christians know exactly what kind of conference this is and help them decide if they really want to attend. 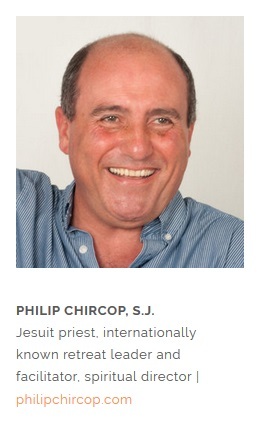 Much information exists on the Jesuits and their “Society of Jesus”. These men are deep occultists oathed to serve the Vatican and the Pope. This is the first and most obvious problem with HIM 2017. So many videos and exposes exist on the Jesuit order but as we race into the apostasy the ecumenical churches are returning back to their mother Rome. Their symbol is the black sun and has the initials for three Egyptian gods, Isis, Horus, Set. 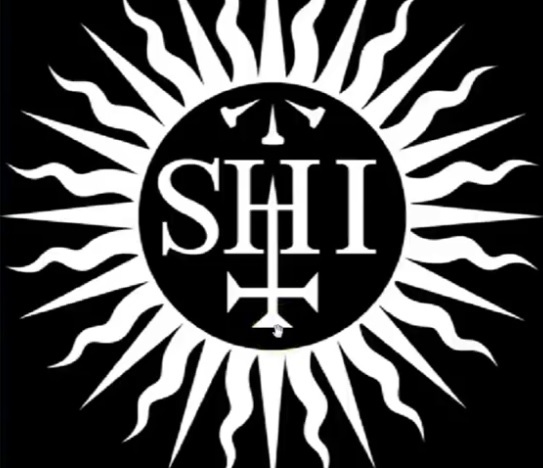 To quickly find out what Jesuits think of what Christians believe just flip their logo upside down. Oh I can already hear you crybabies out there saying I am the one who is crazy but there it is in plain sight. 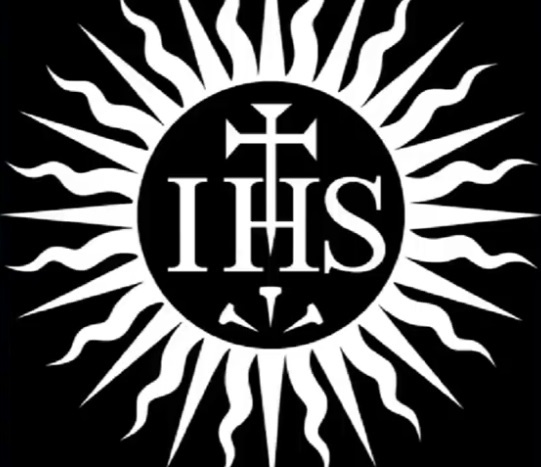 The Jesuits think of Christians and Our Savior as, well, just look at their logo. 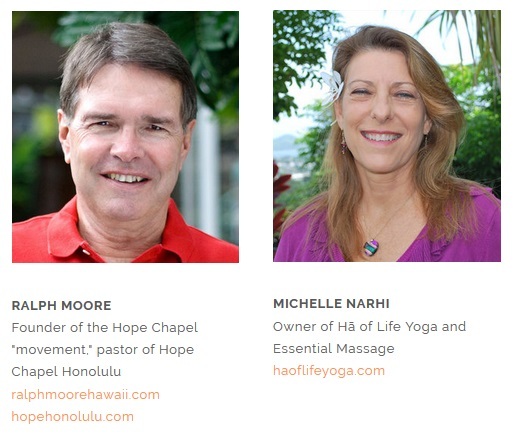 I would think the featured veteran Pastor of the lineup would know better than to share the stage with practicing Hindus but his bio actually is adjacent to this Yoga teacher Michelle Nahri. Another Yoga teacher below, that makes two! Oh come on, Yoga is just stretching, isn’t stretching good? The meaning of a word tells us volumes about what that word really is. If Yoga is just stretching, the meaning of the word should reflect that. 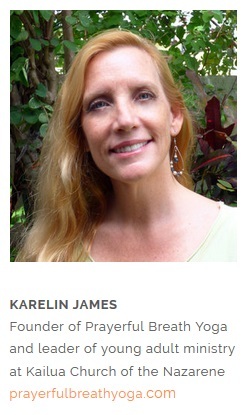 Another Yoga source describes more of the same. Yoga by definition is BEING YOKED or attached to something else. It also means being joined or in union or subjugated or controlled or arrayed as an army. DO NOT BE DECEIVED. WHAT DOES THE BIBLE SAY? The bible tells us EXACTLY what we are NOT to yoked to! This entry was posted in Apostate Church, Celebrity Evangelism, Christianity, Emerging Church, Hawaiian Airlines and tagged Bible, Celebrity Evangelism, Elwin Ahu, Emerging Church, Heresy, Ralph Moore, Revelation on February 14, 2017 by mikeuslan. Hawaiian Airlines has wrapped one of their new A330′s in a very colorful decal with Disney Moana and Maui livery. It should be no surprise that Hawaiian is partnering with Disney again. For those of us who have been around the airlines for a little while, we might remember when the Lilo and Stitch cartoon first came out in 2002, all the Hawaiian employees were given Lilo and Stitch swag to wear on the job. 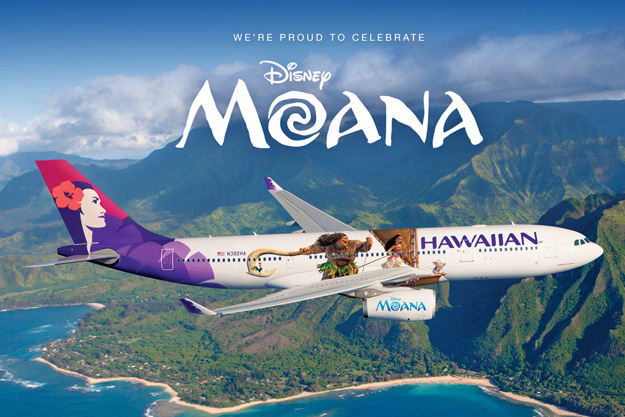 While I enjoy being entertained and flying on shiny and colorful new airplanes as much as anyone else, I would like to springboard a little from this announcement by Hawaiian Airlines and offer a little background on the demi-god Maui and Disney for my readers. Consider these bullet points to discuss with your children before seeing the movie. I don’t have much of anything to say specifically about Hawaiian Airlines except this. It’s some great looking artwork on the airplane and the overhead bins look fantastic. I am sure the passengers will have a blast riding on them! With that being said, consider this my “spoiler alert” — we’re about to go way out into left field here. Consider just clicking away from this post right here, right now — otherwise — if you so choose to continue reading — Grab a cup of your favorite beverage and sit with me for a while, enjoy my intellectual version of a theme park thrill ride! So it should be safe to establish without offending anyone, that Maui is a deceiver who, through causing all sorts of commotion and carrying on is eventually killed by another goddess. Disney for the most part, “modifies” and “repackages” everything nowadays. The original stories are not pleasant bedtime fables to lullaby our babies peacefully asleep. These are scary, frightening, Polynesian versions of similar ancient mythologies, more like The Clash of the Titans or The Brothers Grimm than anything else. 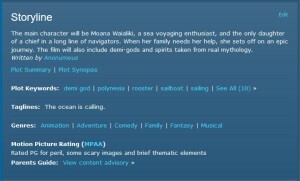 First of all, Disney pulls many Polynesian myths together into this storyline, according to IMDB website the Moana cartoon storyline is about “demi-gods and spirits taken from “real mythology“. Disney claims many other times these stories are all taken from “real mythology”. It sounds like quite the paradox! Is it real or is it mythology? 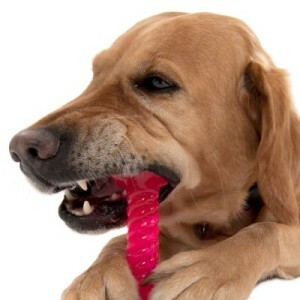 We have heard before of jumbo shrimps and rubber bones for my pretty ugly dog. So what exactly does Disney mean when they say its “real mythology” anyway? Tahiti Info’s website does a good job enlightening this mystery with an article they wrote The true origins of Disney princess Moana. 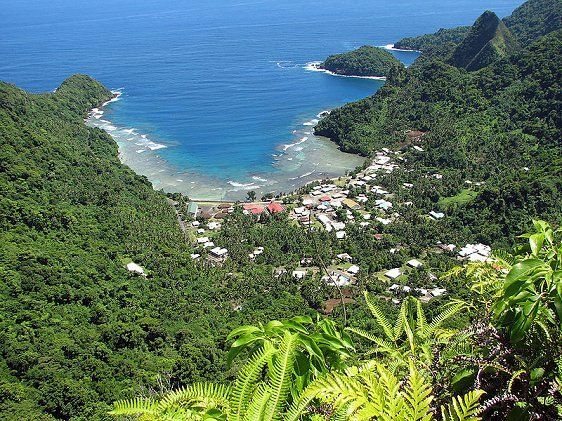 They make a compelling argument that Moana is actually from Tutuila Island, in the American Samoa archipelago. What they also determine is that Disney is not simply using Hawaiian legend and lore as a pretext for their cartoon, but arguably, Disney may have gone to extreme lengths to maintain accuracy, possibly even in the depiction of Moana’s village which looks remarkably like Afono village on Tutuila in American Samoa. I will show you a few more examples of how far Disney had gone to depict this “real mythology”. Many other examples are just jumping out at me. Maybe other people can find a few other references I have missed in the trailers, or possibly in the actual film this November. The movie has not been released yet but Disney reveals quite a bit in their many trailers. 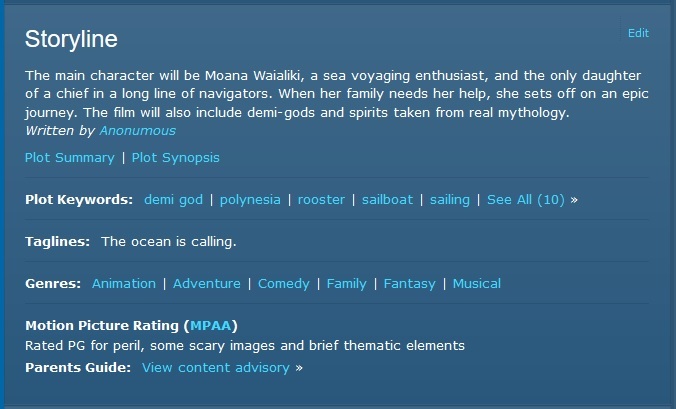 What we know so far is a young girl named Moana teams up with the Trickster & shape shifting demigod Maui to save humanity from a “beast rising up out of the sea”. Everyone learns the power of love and lives happily ever after i’m guessing, but I have yet to see the entire film. I don’t know where to start, but maybe a montage of the current available trailers is a good place. If you haven’t seen the Moana trailers yet. These are all the currently released trailers, including a Japanese one. It is about 6 minutes long and I will refer to it several times throughout this article. Watch this video first if you have the time. One of the first “monsters” Moana meets along her journey is heralded by a lightning bolt striking the ocean. 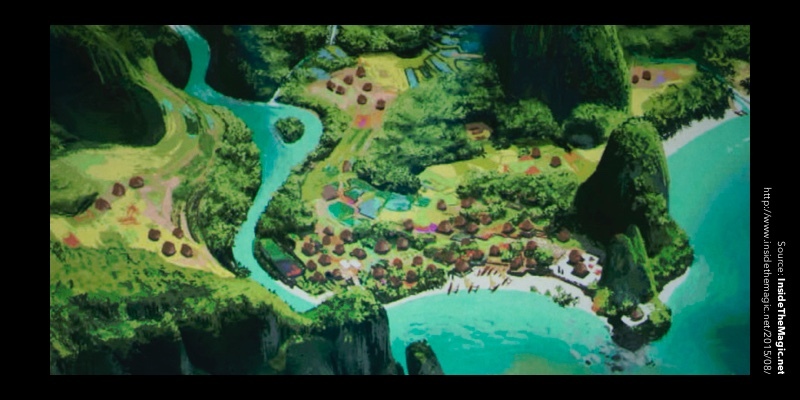 Here is a screenshot of the Moana trailer taken at :10 seconds. Nothing really to see here? For those of us familiar with the esoteric we know the #1 reference of Satan is “lighting falling from heaven” and is first referenced in this manner in Luke 10:18. Is this some of the “real mythology” being referred to by Disney? In the upside down world of the occult, the lightning bolt has become one of the most popular symbols of satanists and occultists. Is Disney ignorant to these symbols? They seem to be so accurate in their attention to detail on all the other “real mythology” they portray. Whatever you believe about Disney, the next scene at :13 thirteen seconds seems to confirm my suspicions about the lightning bolt. 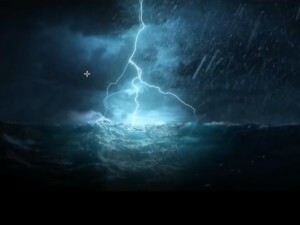 As soon as the lightning bolt hits the water, we see a flaming demon or devil rise up out of the sea. This imagery is not new and found throughout film and literature. What you are seeing here is the “beast out of the sea”. Some may see this is a nod or a tribute to Godzilla which one of the first films to popularize the “beast out of the sea” meme in film. Now this sounds a lot like Revelation chapter 13 which describes precisely a rising “beast out of the sea”. 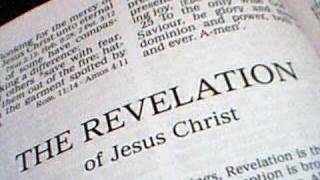 The book of Revelation, found at the end of the New Testament, is what I refer to as “one of the scarier parts of the bible”. So I just realized something as I am typing this out. Revelation 13 is being depicted at the 13 second mark. Coincidence or more “real mythology” hidden in plain sight according to Disney’s Magic Kingdom? I keep coming across this image on the web. I don’t find it on any of the trailers so cant tell if it is the same lava monster we see in the trailer, or a different female lava monster. A lot of Disney fan websites seem to think its Madam Pele. If the Revelation 13 connection proves to hold water, this scene may somehow be referencing Revelation 17 which describes a woman “that sitteth upon many waters” (v1) and who also “sits upon the beast” (v3). These guys at Disney are truly amazing. Disney again knocks this one out of the ballpark. They take an otherwise frightening concept previously only found in horror or sci-fi genres, (like A.I. in Big Hero 6) and get 8 and 9 year old kids everywhere cheering for it. I have a very hard time sharing these scary stories with my kids but here Disney just hits another HOME RUN. This is just incredible how they repackage horror into kids films. 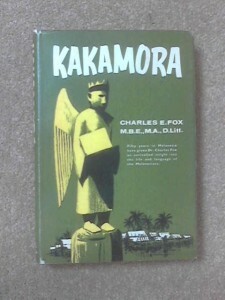 Another example or Disney’s “real mythology” are the Kakamora. At 1:25 Moana and Maui run into “The Kakamora”. The Kakamora are not cute little new Disney critters but more ancient “real mythology” just like Disney promised. According to South Pacific Melanesian lore, the Kakamora are cannibalistic little people, similar to gnomes, elves, dwarfs etc. 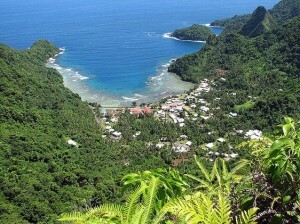 The Mythology Dictionary, describes the Kakamora as: Spirits in Melanesia, living in trees and caves. These beings are envisaged as humanlike, with long nails, varying in size from a few inches to about five feet in height. They sometimes kill humans and eat their flesh. Hawaiian mythology had similar beings called menehune. There is a Christian Author named Steve Quayle who recently finished a book called “Little Creatures” and it catalogues many of the rest of these, the opposites of the Giants, the little people… Steve Quayle is a very thought provoking author. I can’t say if I agree/disagee with him, but I have enjoyed some of his other books. Find it also on Amazon here. 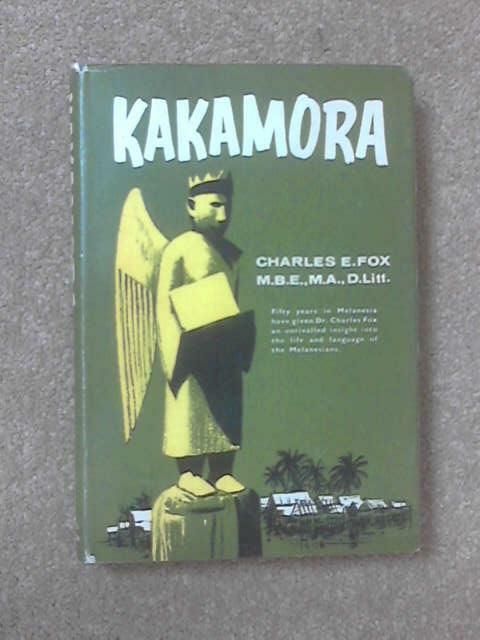 Curiously, an old book written by a Melanesian missionary, Charles Fox, portrayed the Kakamora as having angels wings. The “Night on a Bald Mountain” scene from the original Fantasia proves Disney has been introducing children to the devil, Hell and the occult since the 1940s. Only by now, in 2016 they have just gotten very good at making it a lot more fun. What a contrast from the 1940s Disney “Fantasia” version of Hell and the kinder, gentler 2016 version of Hell in the new “Moana”. Maui gleefully jumps into the bottomless pit and beckons Moana to join him. 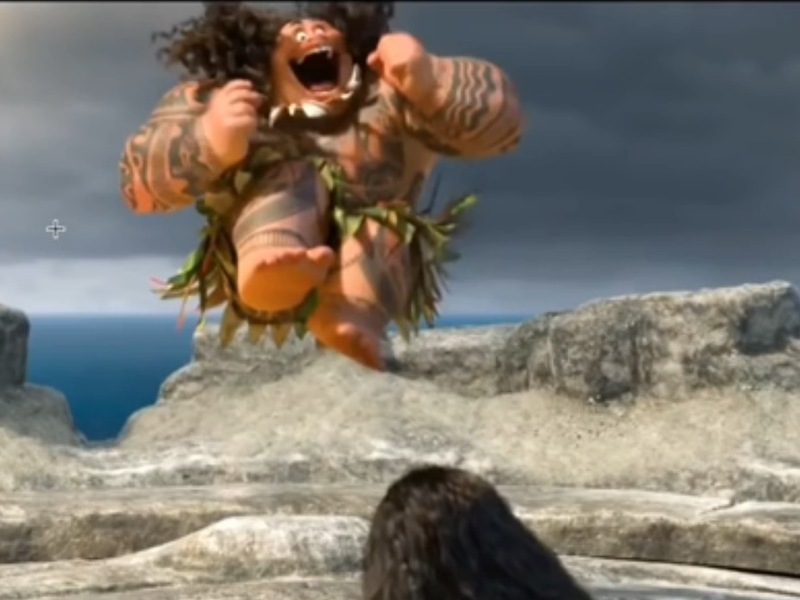 When Maui opens the pit he yells back to Moana “don’t worry its farther down than it looks” and after a few more seconds, “i’m still falling”. Moana still looks scared but she jumps. The book of Revelation chapter 9 describes “a star fall from heaven unto the earth: and to him was given the key of the bottomless pit”. Is this what Disney is portraying here? Is Maui depicting the angel of Revelation 9 opening the bottomless pit? (insert CERN and portal conspiracy theories here) I’m just trying to ask an honest question here, but again, I would have to think, their accuracy to the rest of the mythology in the film suggests they are not leaving any detail to chance in their cartoons. Stories of the demi-gods are found all throughout the Pentateuch and the New Testament, although rarely taught on in the more common 501c3 type churches found around Hawaii and the USA. According to the dictionaries, Demigods are beings who have some of the powers of a god : a being in mythology who is part god and part human. How does somebody become part god/part human you may ask? That is kind of an R rated topic in most churches today but according to Genesis 6 and other parts of the Bible like Jude 6, and 2 Peter 2:4 it appears there were some angelic shenanigans going on around the time of Noah. Psalm 82:1, Revelation 12:7-9, Ephesians 6:9 and Job 1:6 all seem to confirm the existence and corruption of at least some of the Angelic realm. We first see these part god/part men beings, sometimes referred to as “Giants”, “Titans” or “Nephilim” appear in Genesis 6. They are the unnatural offspring of the Sons of God and the Daughters of men. 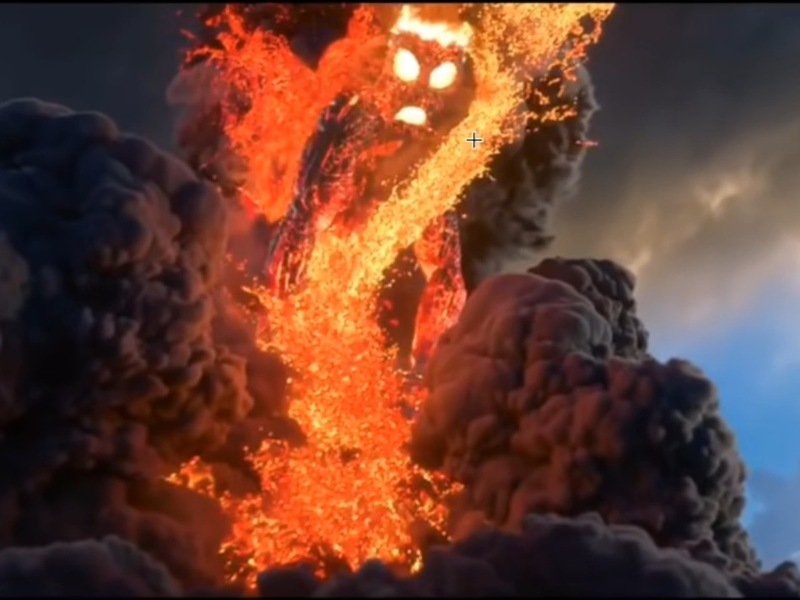 Disney seems to go out of their way to make sure we all get that in the trailer when Maui corrects Moana in her worship of him in this next scene. Disney wants to make sure Moana (and all our kids) are sure to worship Maui properly and never forget to call him by his proper name, the “hero of men”. The worship scene takes place from 0:48 seconds through 1:05 when Maui corrects Moana in her praise and worship of him. Please watch that clip again and also watch around 2:40-2:45 when Moana is again, clearly worshipping Maui again, her eyes closed, in complete devotion and prayer. This is religion. Who needs church when we have Disney! “Moana and Maui will save us all” (watch again @ :15 to :26 seconds into the trailer). Just imagine if they taught us all to worship Jesus Christ so accurately! I know many of my readers do not study the bible, so just to be clear, these offspring of the sons of God in Genesis 6 are NOT the good guys in that story. Specifically, the good guy is a man named Noah, but that is another story. The appearance of the Giants/Heroes/Nephilim in Genesis 6 is actually one of the reasons that God destroys the Earth in a global flood. The heroes of old/giants/nephilim are the bad guys. Maui is one of them. Even the Polynesian stories agree he is a trickster/deceiver. We do NOT worship Maui or any of the demi-gods. They are best not trifled with! This warning found on an old bumper sticker just might apply! Now this is where it gets interesting. Giants are having something of a renaissance in films these days. There are no shortage of new blockbuster films featuring and glorifying ancient tales of the Giants. Disneys “The BFG”, Percy Jackson’s Sea of Monsters, the Japanese anime “Attack on Titan” are just a few recent examples. Several shows have recently appeared on the false History Channel like “Search for Lost Giants” and “Ancient Aliens” which popularize the same stories of the old Giants/Titans and demi-gods. Are Disney and the false History Channel cooperating in popularizing these false narratives of Earth’s ancient world? The History Channel is owned by Disney so hey, why not! They are all one big happy family. Since I mentioned “Ancient Aliens”, Chris White does an EXCELLENT JOB debunking every single Ancient Aliens episode in this 3 hour long full length film. Save that link and watch it later as this is slightly off the main topic of Maui and the new Disney cartoon but real good stuff and it removes much of the mystery behind the movie magic and story telling here. So why such a fascination with the Giants all of a sudden? I don’t know for certain what they are thinking in Hollywood but I do know what the Bible says about the topic. Rejoicing at the same time and insulting? That sounds a little like the “trickster-pest god” maybe? 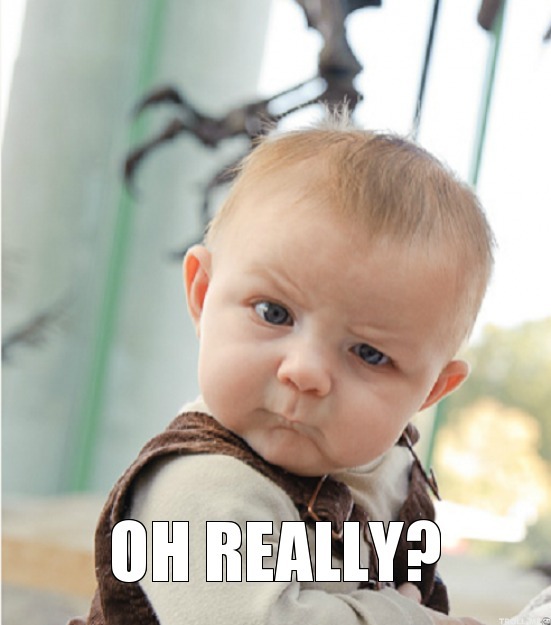 Disney “real mythology” again? If you ask me, it sure does seem like Disney constantly hits bullseyes. They are precise! Jesus himself says in Luke 17:26 and Matthew 24:37 that the end of time will be just like the “days of Noah”. Now, while many churches and theologians debate whether or not this means giants and demigods, the point here is Disney seems to think so, or at least think they can bank some serious coin on repackaging these old stories. I could go on and on. I’m not even going to start with Maui’s tattoos and the shapeshifting or the magical fishhook in the rest of the trailers but suffice it to say, I have barely scratched the surface here. At 3:55 we see a baby Moana parting the sea like Moses in Exodus. The symbolism just doesn’t stop. In the Bible, Moses teaches the children of Israel to worship the true God. In Disney’s upside down Magic Kingdom, Moana is a false Moses, teaching our children to worship false gods. If any Hawaiian Airlines employees have read this far please don’t take any offense. I’m not hating on Hawaiian. Many corporations and airlines honor the magical and the occult. I myself work for a corporation that has entire divisions named after the Giants of Greek mythology so what are we going to do? These symbols and references are more and more all around us. We are not supposed run away and hide in the forest or some remote island. Jesus Himself instructed His followers to “Occupy till I come”. (Luke 19:13) There’s not much else we can do except be educated and also to educate our children. I will keep flying on Hawaiian when the opportunities arise, and I will also take my kids to see Moana sometime after Thanksgiving, and we will have great fun while doing it however, they will know beforehand exactly what it is they are watching. I sometimes have to apologize to my kids. I think I ruin the fun for them sometimes but I am just being a good parent. Being entertained is a wonderful activity to enjoy together as a family however according to Deuteronomy chapter 6 our main purpose as parents is not to entertain our children, but rather instruct them! 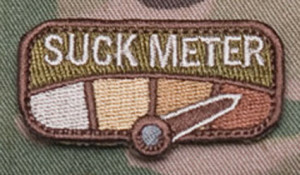 The buck stops here, with us. This entry was posted in Christianity, Disney, Emerging Church, entertainment industry, Hawaiian Airlines and tagged Bible, Disney, Moana, Revelation on October 17, 2016 by mikeuslan. 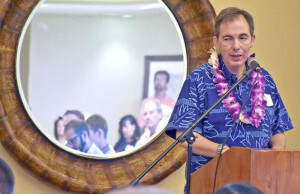 Mark Dunkerly, the CEO of Hawaiian Airlines had the opportunity to visit the island of Kauai and spoke at a Kauai Chamber of Commerce luncheon. The Garden Island News responded by writing a story that seems to be a tongue in cheek jab right back at Hawaiian’s most illustrious of all executives. “Hawaiian Flying High” was the hazily sublimed title of the article. OK, one thing for certain is that Hawaiian does not spend nearly enough money advertising with the Garden Island News. A center spread once or twice a week or even a daily banner across the front page advertising Hawaiian’s low fares to Kauai just might solve the problem with this reporters opinion. Most large corporations have huge advertising budgets with the local papers to help curtail unwanted criticism. I’m just saying, everyone else does it. Well, I would like to give Mr Dunkerly a fair shake. The entire visit to Kauai seems to be an attempt by Dunkerly at defusing building tensions over perceived high airfares with local travelers. So I ask my readers this. 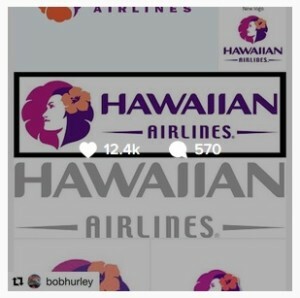 Is the criticism of Hawaiian Airlines fair? Are the airfares too high? I would like to offer a suggestion. Let us pick the easiest “fact check” the normal lay person like me can verify. Rising government taxes and highway projects are hard for us to translate into tangible “yes or no” facts. However there is one thing that Dunkerly claimed that is very easy for us to verify. SIXTY NINE DOLLARS TO KAUAI? lets holo holo! Well there is an easy number to verify. Go to www.hawaiianairlines.com and check their published one way fares from Honolulu to Lihue and lets all see how easy the $69 average fares are to book. $69 average means there will be fares LOWER than $69 so this is an outright bargain for a one way flight on a jet anywhere. Using the word AVERAGE suggests any of us should be able to find a lower than $69 fares. Verifying this is easy for anyone to do. Mark seems like a brilliant executive and I can’t imagine he would put out a number like this without it being triple verified. After a quick check I do see a few $72 fares on the early morning flights (5:14 AM & 5:56 AM only) which is actually a $58 fare with $14 in taxes and fees which comes out to $72. Today is the 7th of January and the earliest I could find a $72 fare is the 19th so 12 days out. Not bad at first glance but do the rest of the facts check out? Is this really an “average” fare and how easy is it to secure a booking at this fare on “AVERAGE“. Now hopefully we get some readers to comment. I know this isn’t exactly USA Today but anyone out there reading this with an opinion, please feel free to speak your mind. This entry was posted in Aviation, Hawaiian Airlines, Inter Island and tagged Hawaii, Inter Island, Kauai Chamber of Commerce, Mark Dunkerly, Oh Really? baby on January 8, 2016 by mikeuslan. The Garden Island News has published an article about Kauai County Council asking state lawmakers to explore incentivizing interisland airline competition in the State of Hawaii. The Star Advertiser and KITV have also reported on this proposal, along with others. I like the spirit of the “Unconquered Island” lawmakers, but lets just stop for a minute right here. The whole proposal has several problems. First here are a few snippets. Ann Botticelli, SVP Corporate Communications and public affairs officer, speaking for Hawaiian, said the company keeps its fares low and that a one-way ticket price from Lihue to Honolulu for 12 months ending March 30 was $68 (or $82.70 with taxes). Well I DO NOT think the government, local or federal can fix any problems, perceived or otherwise, with interisland air travel. They can’t force someone IN to business as easily as we have seen airlines forced OUT of business in recent years. New or existing airlines might not want to get tangled too tightly with State of Hawaii lawmakers. These lawmakers could have just listened to me when I warned them about Mesa back in 2004 but that’s long forgotten history now. An ounce of prevention would have been worth a pound of resolutions and “spurring discussions” but it is now 2015 and both Aloha and Mesa are long gone from Hawaii’s skies. Mesa left Hawaii’s economy a “scorched earth” (precisely as I predicted in 2004) and Hawaii has barely recovered now many years later. Hawaiian can and will charge whatever the market will bear. No other airline wants to enter the vortex of interisland passenger travel after so many other failed operations in recent history. The people of Hawaii were played. How did anyone think $19 and $29 tickets would turn out? Just be thankful Mesa’s shame in Hawaii is unforgettable to this day. Hawaiian would eventually chose to use Empire instead of Mesa for their Ohana operation and Mesa would ultimately depart Hawaii for good. Empire is the same certificate holder that operated Mahalo for Robert Iwamoto back in the 1990s. Small world isn’t it? If you like my posts, use the toolbar above and bookmark my homepage. Much Aloha! This entry was posted in Aviation, Hawaiian Airlines, Inter Island and tagged Aviation, Hawaii, Inter Island, Kauai Chamber of Commerce, Mark Dunkerly, Oh Really? baby on November 8, 2015 by mikeuslan.